The Longhouse is a gathering place where families, neighbours, and nations share in their cultural traditions. Upon entering, guests are greeted by a striking feature wall representing a ‘house-front’ with a human welcome figure. House-fronts in Northwest Coast society were traditionally decorated in carvings and painted colours, and this large-scale interpretation pays homage to this practice. The installation signifies guests’ arrival at their temporary home and imparts a sense of comfort for weary travellers. 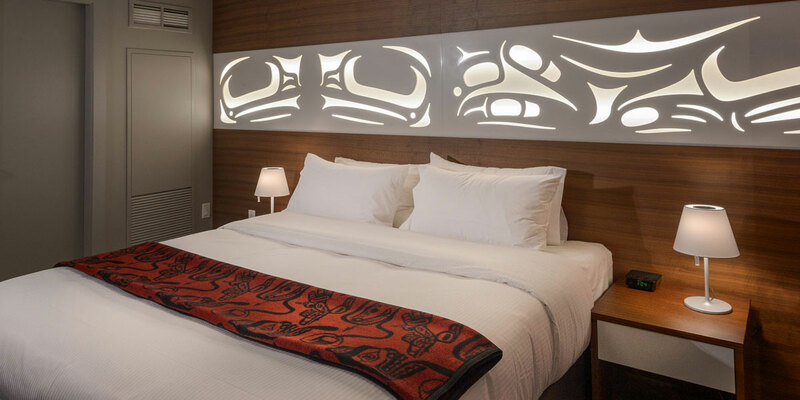 A second welcome figure, an illuminated stainless steel totem carved with bear motifs, lights the path into the suite.The Bear is considered an honoured guest among Northwest coast communities and sculpted totem poles were commonly located outside family homes. The illuminated bear totem thus greets visitors at the entrance of their new ‘home’ and identifies them as honoured guests during their stay at Skwachàys Lodge. The headboard wall pays tribute to the Frog. Revered for its ability to live both in water and on land, the Frog is considered a spirit helper who traverses the natural and supernatural worlds. Here the Frog aids guests in their transition from waking to dreaming. Designed as a triptych, an artwork divided into three sections, the frog motifs are set within a white plexiglass light-box. When illuminated the installation emits a soft light that is calming and restful. 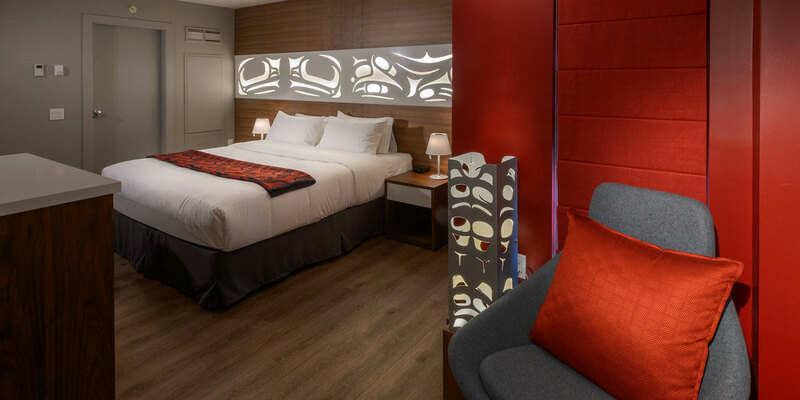 Modern in design but traditional in inspiration, each artistic piece within the Longhouse Suite pays tribute to traditional customs in Northwest Coast Aboriginal society. Inspired by artist Sabina Hill’s contemporary take on classic Aboriginal motifs, Inside Design Studio created the Longhouse Suite to showcase her elegant, architectural pieces. 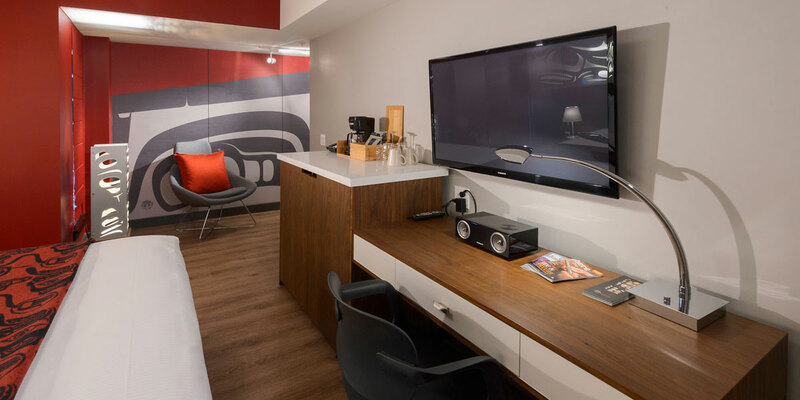 To complement Hill’s modern style, the team elected a streamlined interior design aesthetic. Clean lines, sleek surfaces and light bedding are fresh and minimalist, which focus attention on the room’s featured artwork. To animate the human welcome figure at the entrance, the hallway is covered in a red and grey texture. These colours are echoed in the decorative blanket and lounge chair, which together with the wooden furnishings and headboard wall typify classic aspects of West Coast design. While traditional in inspiration, each design element within the Longhouse Suite is modern in style and thereby embraces the evolution of Indigenous artistry.